Appvion is a manufacturer of specialty coated paper products including sheet products sold through a distribution channel and purchased by over 30,000 sheet printers. The company wanted to find ways to directly connect and engage with printers that would generate sales leads and strengthen customer loyalty. Early campaign themes revolved around the building of Team Appleton (later Appvion) and used sports analogies on the importance of product performance and the difference it can make in the printing business. Appvion is a manufacturer of specialty coated paper products including sheet products sold through a distribution channel and purchased by over 30,000 sheet printers. The company wanted to find ways to directly connect and engage with printers that would generate sales leads and strengthen customer loyalty. 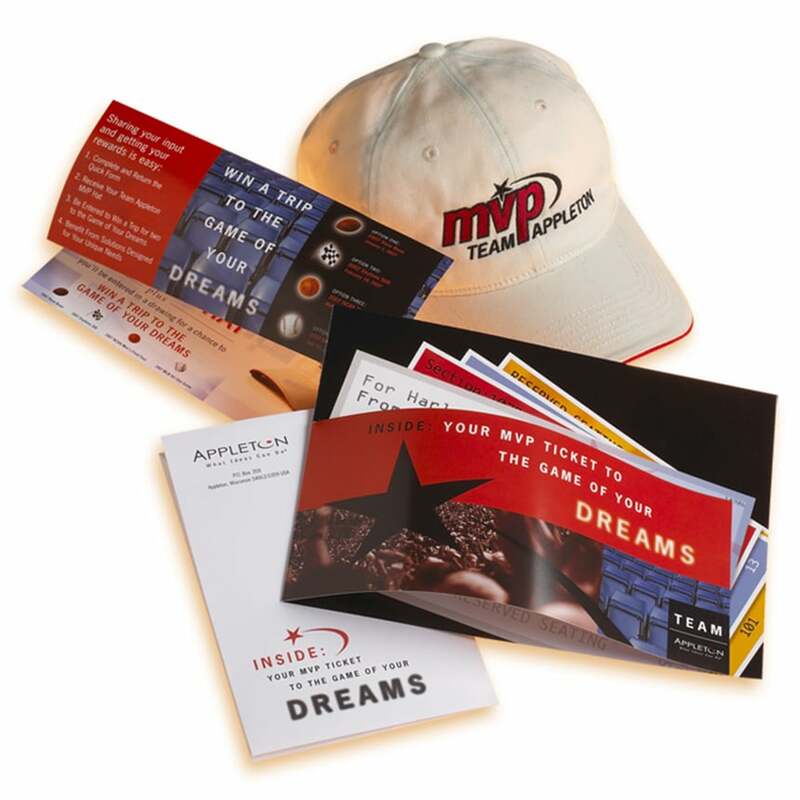 The MVP (most valuable printer) sports theme offered Team Appleton (later Appvion) members numerous rewards for continued growth, participation, and engagement. Appvion is a manufacturer of specialty coated paper products including sheet products sold through a distribution channel and purchased by over 30,000 sheet printers. The company wanted to find ways to directly connect and engage with printers that would generate sales leads and strengthen customer loyalty. This campaign created a connection with printers by celebrating one of their beloved tools – the glue brush. 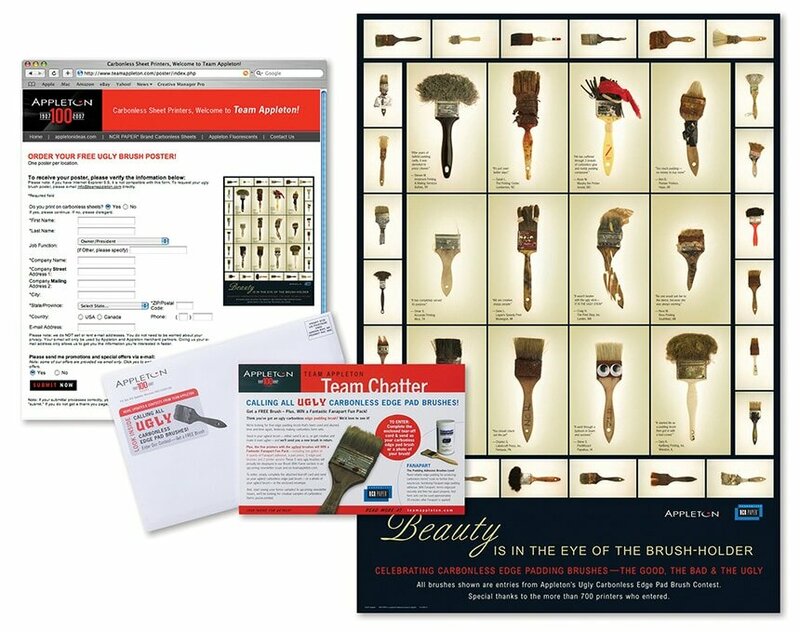 Members submitted entries and winning brushes were immortalized on a poster. Appvion is a manufacturer of specialty coated paper products including sheet products sold through a distribution channel and purchased by over 30,000 sheet printers. The company wanted to find ways to directly connect and engage with printers that would generate sales leads and strengthen customer loyalty. 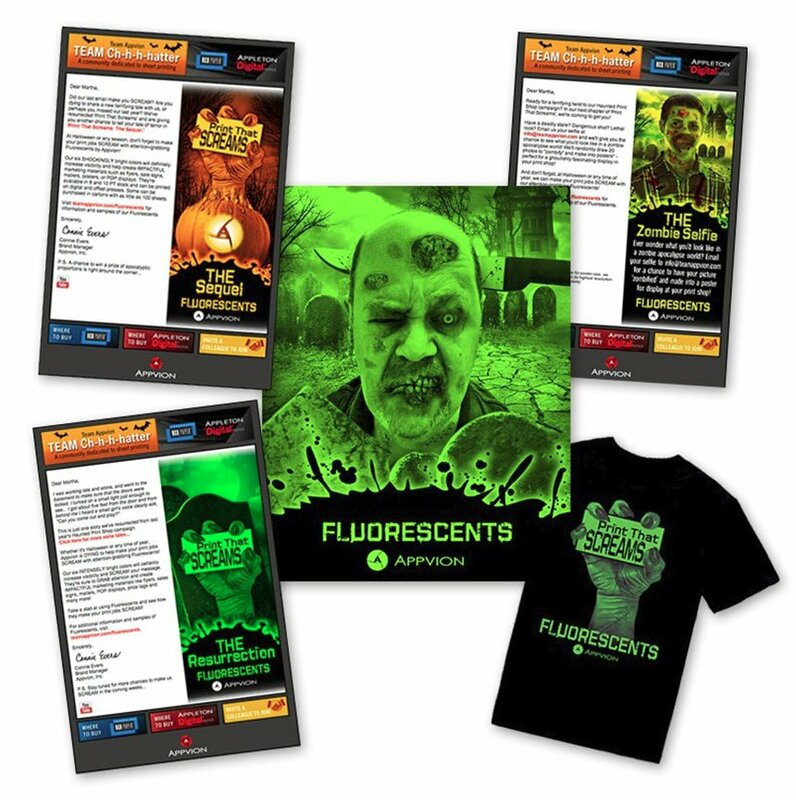 To tie in with the Halloween season and Appvion’s Fluorescents product line, the Print that Screams campaign theme encouraged printers to submit haunted print shop stories; they also submitted their pictures, which were “zombified” and printed on fluorescent stock. Appvion is a manufacturer of specialty coated paper products including sheet products sold through a distribution channel and purchased by over 30,000 sheet printers. The company wanted to find ways to directly connect and engage with these sheet printers that would generate sales leads and strengthen customer loyalty. 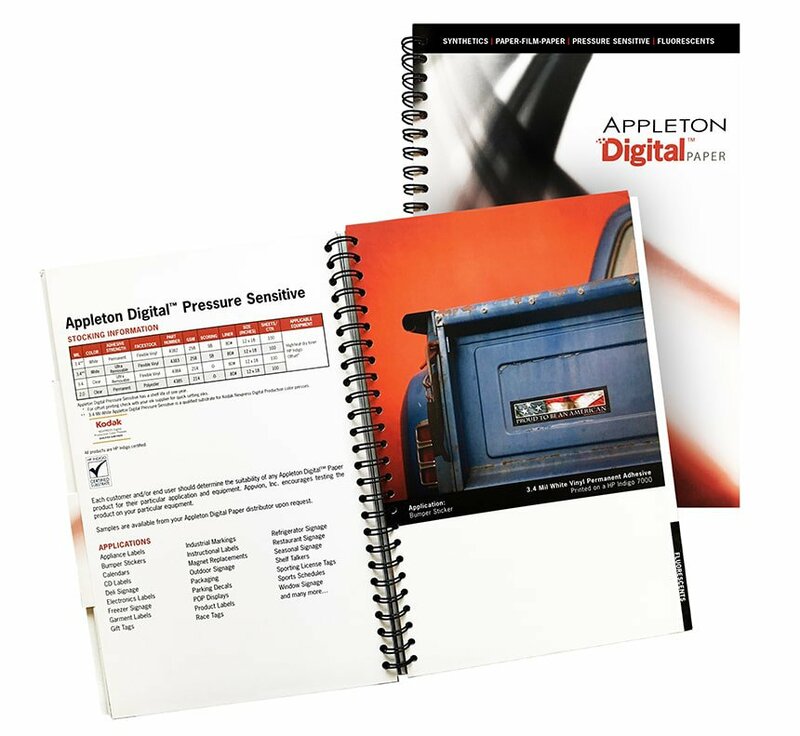 Appvion had launched a new line of digital products and needed a comprehensive swatch book that included digital print examples on the actual product stocks.